Quality and quantity of sleep affects your health and well-being. Sleep promotes creativity, attentiveness and decision-making capability. Imagine waking up with less discomfort, rested because you no longer toss & turn at night. With Patented "Arm Tunnels System" - We Promise this will be Your Preferred Pillow! Why Do We Call It “THE” Better Sleep Pillow? We believe satisfying sleep is a fundamental right everyone is entitled to. You should be able to wake up each day feeling rejuvenated both physically and mentally. This was our mission and the firmly-held belief behind the development of the Better Sleep Pillow (BSP), our best-selling product on Amazon! So how does the BSP earn such a title ? Sleep you get with the BSP is deep and satisfying. Anyone suffering from muscle pains or poor circulation can benefit from a night’s sleep with this pillow. Guaranteed. What is the Better Sleep Pillow ? Ergonomically designed, the Better Sleep pillow minimizes stress on your back, neck, and shoulders - helping to prevent that biting pins and needles sensation. If you’re contemplating if your pillow is the problem, odds are that’s exactly it. If you could find a simple solution, wouldn’t you attempt it? Now you CAN try this comfortable and convenient better sleep solution RISK-FREE with one of our “seek before you sleep options”, including our 60-day money back guarantee and our “Try it At Home” Pick 2 Program option, both of which give you time to see for yourself how truly terrific you’ll feel! ORDER NOW and be well on your way to finding your “sleep spot” for deeper sleep." Since the beginning of mankind, finding a comfortable place to lay your arm while sleeping on your side or stomach has been a struggle. 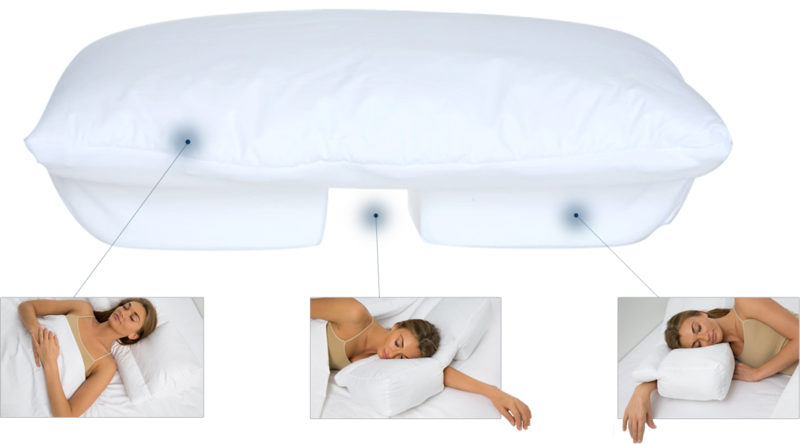 We created and patented an “Arm Tunnel System” on the Better Sleep Pillow. The system consists of two tunnels, one down the middle and one across the front - giving you multiple options where to place your arms comfortably, which solves that age-old problem. Using the BSP, you will find what we like to call your “Sleep Nook,” the place you reach where you are optimally comfortable and are able to sleep all through the night. The two tunnels allow you to position your arm and shoulder in multiple ways. Flip the Better Sleep Pillow 180° to allow for even more comfortable positions. This leads to a more restful sleep promoting improvement in both cardiovascular and psychological. “Love it! Stays cool. And feels great for my bad shoulder." Just think, a simple pillow could be an affordable solution to your annoying problem! And you will be kind to your body by not needing medication or other unnatural solutions to achieve the sleep you need. We contribute to better days with our friendly and knowledgeable customer service team that’s happy to assist. You will feel comfortable and at ease shopping with us, knowing that our world-class customer service upholds a no-hassle return policy. You can try this pillow risk-free with one of our “Seek Before You Sleep” options which includes our 60-day money-back guarantee. We are so convinced that you will get a deeper, more restful sleep when you find your “sleep nook” while nestled in the pillow - that we completely backup your purchase. You will appreciate mornings waking up fully rested and ready to take on the day. Because deeper sleep promotes your general health and well-being, if you suffer from one of these ailments or a host of others, your symptoms can be drastically improved thanks to comfortable, restful nights provided by this better bed pillow. PROVIDES TWO ARM TUNNELS with a thick layer of padding for your arm to burrow under. One tunnel goes down the front and the other down the middle, so you can easily adjust your sleeping position. PERFECT PILLOW CONFIGURATION for sleeping on either side of your body with your arm under the pillow. 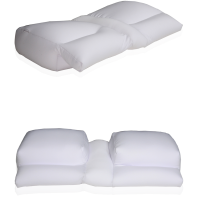 Flip the pillow 180° for different angles. ERGONOMIC DESIGN is great for relieving neck and back pain caused by uncomfortable arm positioning when sleeping. Stomach and side sleepers, your neck will be aligned for better support. IMPROVES CIRCULATION to prevent the sometimes painful sensation when your arm falls asleep. BETTER SLEEP PILLOW means a better night of rest which leads to an improvement in all areas of health and all-day energy. If you’re a back sleeper, you need a thinner pillow so your head is not pushed too far forward. Using a neck cradling bolster in the bottom 1/3 of the pillow allows perfect support, and helps your head stay parallel. Side sleepers need a firmer pillow to fill in the gap between the ear and outside shoulder. By placing your arm to the side or under your head - your neck stays in the best position for a restfull sleep. If you're a stomach sleeper look for a very thin and flat pillow. You need a pillow for your head that has a low profile. FYI - Sleeping on your stomach can help improve digestion. 60-Day Money Back “Sleep Spot “Deep Sleep” Guarantee: Pick your perfect Better Sleep Pillow and try it at home for a full sixty days. If you don’t experience deep sleep, simply return the pillow for a refund of the cost. The only thing you pay is the return shipping. What are some tips for picking the perfect pillow? Don’t fall prey to uninformed pillow picking, simply choosing what’s least expensive or the fluffiest. Consider your sleeping habits and your body’s individual needs. Do you suffer from snoring or neck and shoulder pain? 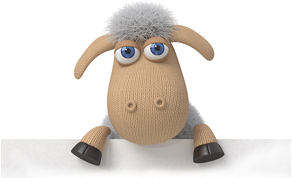 Do you find it difficult to get a decent rest at night? You may just be a perfect candidate for the Better Sleep Pillow. Is this just another pillow, like one I can buy at a department store? Not at all! The Better Sleep Pillow 's are anything but ordinary. It was designed for the way you sleep as you move around at night - side, stomach and back. 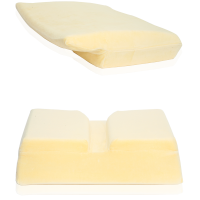 The Better Sleep Pillow is made of 100% urethane memory foam for extreme comfort and quality. Its unique design with a recessed portion for your arm along the entire length of the pillow and through the underside, allows you to sleep in the position that is most natural for your body. 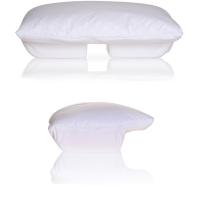 These recesses provide support to your arm, head and neck reducing pressure and helping you to get a deeper and more restful sleep. Will the Better Sleep Pillow stop me from snoring? Unfortunately, it will not stop you from snoring. However, it will reduce snoring by aligning your head and neck in the proper position to keep your airways open. This product is a godsend. These pillows have a design that can support my neck comfortably and eliminate my snoring. I would not trade them for the world." I’ve never had a better pillow than this one, ever. 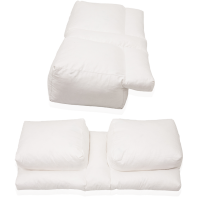 It doesn’t flatten out like your usual pillows and the height is best for side sleepers. I’ve been waking up with less headaches now. It’s worth every singe penny." My husband loves the pillow, his stiff neck has finally disappeared. He’s tried many pillows but nothing that gives this much support." Outside of surgery, I dont think there is anything that will truly keep me from waking up with pain in the morning, but this pillow has made a BID difference for me! I've gone from a huge amount of pain to being able to tolerate the way I feel. It might not sound like a great review but it really is..."
It's worth every penny! Before I bought this pillow, I would wake up a couple times a week with migraines and neck pain. My neck would actually pop almost every time I switched sides. I knew some, if not all of this could be attributed to my current pillow, so I was desperate to try something new an..."
We bought this pillow, at my husband's insistence, and it has been great! My husband has arthritis in both his shoulders and damage to his rotator cuff and since using this pillow his complaints have gone down to zero!!! He sleeps much better and is able to exercise without any complaints of pain. S..."
This pillow is a hit. I've already adapted to its firminess and it has lessen lessen my snoring." I bought this so that my wife will not be disturbed by my snoring. The pillow seems to work but I feel uncomfortable with it. " Being pregnant, it’s really hard to find a suitable position while I’m sleeping or lying in bed without it causing me intense pain in my shoulders and neck. I cannot even sleep on my side due to the pain that occurs when I wake. Since I’ve been using this pillow the pain has disappeared comple..."
This pillow has alleviated my neck cramps in the morning. It took me some time to get accustomed to the pillow but once I did I realized I cannot miss a night without the pillow. I no longer wake up with terrible neck pains and I’m sleeping so much better now. This pillow has really been amazing." I sleep very well whenever I use this pillow. I don’t understand why there are so many negative reviews bout it. This has helped me tremendously. The angle and firmness of the pillow allows me to sleep soundly every night. I am always comforted well with this pillow. I almost cried one time when I..."
Ever since I started using this pillow I haven’t been experiencing dead arm which I usually do when I wake up." AMAZING!!! Great night sleep... Finally!!" I thought this would be just another one of the countless pillows I have tried, but it turned out to be a wonderful surprise. I can sleep on my side now! It really works as it claims. The material of it's general construction feels like very good quality, dense memory foam. 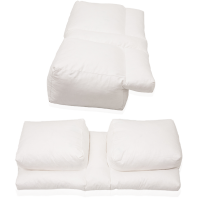 The density and firmne..."
Immediately after I began using this pillow my shoulder pain was reduced. I've used it for more than 6-months and I would recommend it to anyone that is having shoulder pain from sleeping on their side. My only complaint is that the zipper broke off of the included pillow case the first time I tried..."
The cover is hard to put on. Must fold in half. Company was very nice telling me how to get cover on. Took pictures and sent to text. Then did facetime on iphone to show me. They said will make a how to video soon :-) "
love love love it! Arm does not go to sleep - no more pins and needles"
Order Two Pillow But Wanted to Return 1 - The 60 day guarantee from the manufacturer is not true you will not be able to return your pillow for full refund - gave 85% because was hair on , so basically you will just spend $99 on a pillow. The product was much better than great. The small version wa..."
This pillow is great for me, I dont sleep with out it - i bought another one." My husband loves the pillow, his stiff neck has finally disappeared. He"
This pillow is great for me, I don’t even consider using any others anymore. You can turn it to any angle and is great for sleeping on the side or back. It’s also great for neck support and sleeping on my back. Great pillow, just right for me." "The perfect pillow for me! I have a torn rotator cuff which is really painful, so I when I saw this arm tunnel pillow I thought I would give it a try. I'm really glad I did! This pillow keeps my arm stable while I sleep which prevents further injury and provides me with some relief. Prior to using this pillow I would awaken n..."
I didn't want to put much faith in this pillow, the price alone was the major obstacle. I've tried in the past to find a solid pillow but with three kids and life in the way, just couldn't justify the cost. I spent one night on this beauty and it was the first night,in quite a while, I didn't have a..."
I was very skeptical about this pillow after receiving it and examining its structure. I was all set to write a snarky 1-star review about gimmicky over-priced "Sham-Wow" type products when I noticed something important. After using the Arm Tunnel Micro Cloud Pillow for the last two weeks, I'm sleep..."
When I opened the box and found this oddly shaped pillow I didn't know what to think. True, it looks exactly like the photo, but somehow it's a little more odd up close. I'll confess that I don't find the arm tunnel to be much of an asset. It never seems to be in the right spot for me. Also, I'm not..."
The Arm Tunnel Pillow Micro Cloud Pillow IS like a cloud. There is a zipper on the cover, so it can be washed. You do not cover the pillow with a case. That would defeat many of the benefits this pillow affords you. We deal with a lot of pain here. I know that a good night's sleep is critical to o..."
I found this pillow to be very comfortable, and very useful, providing good support for the head and neck. As advertised, it facilitates side sleeping best--the arm tunnel is a very bright idea. I think the cost might be a barrier to the average person, but, compared to a restless, sleepless night, ..."
This pillow is far better than I expected. I've always preferred down pillows and have not found synthetic ones disagreeable. But since I have persistent neck discomfort, it's been hard to enjoy a truly restful night's sleep. I have used this Cloud Pillow now for two weeks and my neck has never felt..."
The Arm Tunnel Pillow Micro Cloud Pillow is designed to help side and stomach sleepers sleep better at night. It is thirty inches wide, four inches high, and 15.5 inches deep with a "tunnel" in the middle for your arm. It is filled with micro beads so the pillow never loses its shape. As a lifelo..."
I totally do not get the whole idea behind this pillow. I am having extreme pain with my arm, but the pillow did no good. I would stick my arm where I was supposed to, but those micro-beads spread out and my head sinks. I like my head elevated, and double over my pillow when sleeping. You can't do t..."
I've spent quite a lot of money on pillows, and until now I haven't been quite happy with any of them. Perhaps my best option until now has been no pillow, but just like trying to sleep without any kind of blanket it's just habitually hard to sleep like that. What I love best about this pillow is..."
This pillow is worth every penny. I actually have an extra pillow in the closet just in case something happens to what I have on my bed. I don’t think I can spend a night without this pillow ever again. I’ve tried a lot of pillows and none of them had the effect that this one has on me. It’s a..."
I can't believe just how much I love this pillow! Since I've received it, I can't go to bed without it and it seems to have cured my problems with falling asleep right away! I've always been mostly a stomach sleeper and if you are, then you know that you never know where to comfortably put your a..."
This pillow is extremely comfortable and I really enjoy it. It feels wonderful to wrap yourself around it. It will especially be appreciated by "birthday suit" sleepers. As for less tossing and turning through the night,that is debatable. That has more to do with your emotional state than the softne..."
This was my first time using one of these new "funny looking" pillows. And I'm goad I had the opportunity to review it! Before starting, I want to say that I believe among the millions of Amazons products in the world, Pillows are very personal. What works for one may not work for another. What I..."
I am a side sleeper who wakes up to find my pillow bunched up under my arm, folded in half against the headboard, or flung onto the bedroom floor. Over the years, I have tried feather pillows, down pillows and memory foam pillows with moderate-to-miserable success. My last one was a memory foam p..."
Love it! Stays cool. And feels great on my bad shoulder." I like this pillow even though it has a different feel from regular down or microfiber or polyester pillows. I like the Arm Tunnel because I like to sleep on my side with my arm under my pillow. The pillow is filled with micro beads. When I lay my head on the pillow I can feel the beads. It is a ..."
The Arm Tunnel Micro Cloud Pillow probably looked good on paper in the design shop, but somehow isn't as fantastic as I hoped. In theory, the idea of a pillow that has a built-in space for your arm is a great concept (primarily for stomach or side sleepers). However, the pillow is questionably const..."
This is such a floppy, cozy pillow. I typically have insomnia, have a very hard time falling asleep frequently, and get quite a few migraines & general headaches, so a good pillow is a serious requirement for me. I was not sure what to expect with this one, since it's got such a unique design, but a..."
Since sleeping with the Arm Tunnel Cloud pillow I have not woken up with a neck ache- previously it was every single morning. I love it and highly recommend to stomach sleepers!" This pillow works wonderfully whether I am sleeping on my side or back. I love the little shoulder "shelf" at the front of the pillow, it gives extra support for my head against my shoulder, something that I haven't found in any other pillow so far (I have about 12 on my bed, most of them "specialty..."
The very good: The constant discomfort in my neck, shoulder, and upper arm (due to side sleeping) has ended since I began using this pillow. The good: did not have a strong smell that some other reviews mention. The bad: As a slender 5'4" woman, I ordered the small version for people 5'5 and u..."
Hi there. My name is Dr. Joseph Berke, My son Jason and I are committed to helping people get the deep, restful sleep they need to wake up to a better tomorrow. Throughout the years, my son and I have both had our share of unsatisfying sleep sessions. In fact, my lifelong struggle for satisfying sleep laid the foundation for our mission to create an ergonomic sleep pillow that allows you to find your “sleep nook,” which is a comfortable position you find that allows you to sleep deep all through the night. I am a neurosurgeon and an inventor. All of my life, I remember being a side-sleeper, suffering from the age-old problem of searching where to put my bottom arm during sleep. I always woke up, often several times in a night, with a sore shoulder and a numb arm. I realized that the only time I experienced a truly restful sleep is when I fell asleep on the sofa with my head on the armrest. Right there, on the comfortable couch, is where I found my “sleep nook” and the idea for the “Better Sleep Pillow” was born. Hello. I’m Jason Berke. Like my father, I have also spent countless nights tossing and turning and trying to find a comfortable way to position my arm under the pillow. For most of my life, I would wake up sore, stiff, and not at all rested. My father helped me finally find my “sleep nook” and together we have collaborated to come up with many designs to help you find yours! We believe that waking up every morning feeling refreshed and ready to take on the world is a fundamental right. Our mission is to help you have better tomorrows, which starts with restful sleep.